My hand hurt because I usually knit Combined, with the yarn in my left hand, and it suits me just fine. 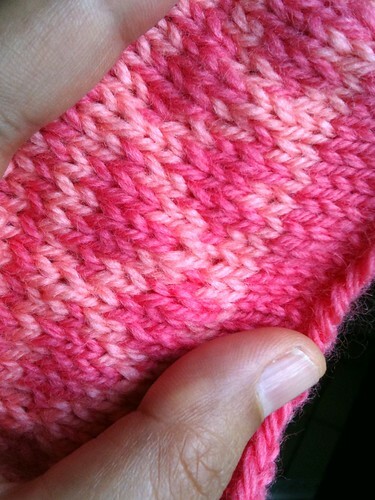 For working more than one color per row/round, though, it can be slow going. I've tried carrying two colors in my left, with wonky results. I've knit with one color at a time, and that works for some colorwork. Figuring it's a skill I want to acquire anyway, I've been knitting this cozy with one color in my left hand and one color in my right. It feels awkward and my tension is still a little uneven, but nothing that wouldn't even out a bit with a good blocking and which really doesn't matter too much (it's a hot water bottle cozy, after all, it just needs to keep the bottle insulated and keep it from burning Mom). The lack of contrast in the colors is just not working for me, though. Can you tell that the colorwork strip is a band of hearts? I can't, and I knit it. I wound off half the skein of the darker pink and put it in dyebath of red and pink food coloring last night, and I'm also going by YarnStory this afternoon, where I may just go ahead and buy more yarn. Hopefully this will get done on time! Pattern: ISBN Hot Water Bottle Cozy by Rachael Herron, modified to use the colorwork chart for Hearty-Stripy Socks by Polly McEldowney.